The old world charm in our local park never ceases to amaze me. As I looked for more patterns to practice my tangling skills, I found inspiration in all the stairs dotting our beloved Prospect Park. The following pictures were taken separately but all part of the same structure. Can't wait to see how the tangles turn out. I LOVE ART. I love how it makes kids squeal when they put something on paper, run over to you, eyes bright with confidence, jump up and down and say "see - see what I did". In our children's eyes, it is not scary and it feels good to just let go and relax. We should look for every opportunity to relax and feel good and bring out the kid buried deep inside. I try to do that as often as possible, this time through Faces 101 with Carla Sonheim. These were done with our left hand - super scary! This one you could not take the pen off the paper - one continuous line - even scarier. For this one, the eraser did all the work and these mysterious folks appeared. Mummy - look at what I did! It all started with a YouTube video on whimsical faces. Always believing that art could heal any hurt, little me and big me set out to spend some girl time drawing fun happy scenes after work (everyday). Dare us to utter these sentiments aloud, besides jewelry making, cooking and inventing, we are hooked on all things outrageously nonsensical and certainly out of proportion. And... we are learning valuable art techniques in between. Tam, Wyanne , Suzi, Juliette (just to name few) have taken the Art of childlike fantasy to a level any adult would enjoy and appreciate. Furthermore, the act of releasing pent up thoughts and emotions within the process of creating these incredible layers of colors and shapes and symbols are certainly the least expensive way to see a psychologist. Here are some links, we are especially excited about these artists because the work they do comes from the heart. Go ahead healing can be fun. Soufflé formage, sil vous plait! Since the Cooking Channel has returned to our cable lineup, it has become a Saturday morning must. Today we watched Luke Nuygen visit his cousins in Paris and the history of France in Vietnam came alive. Le Soufflé, where every course is served... well as souffle was our favorite part. We were so delighted by what Chef made, we wanted some immédiatement après. Not wasting anytime, we googled the ingredients of a quick and easy cheese souffle and came up with the One Pot Chef from Australia (Sorry Luke we went with another Australian). His youtube instructions and ingredients were super simple and we had everything at home (with a couple of interchangeable ingredients). Carla Sonheim is a creative genuis and she surrounds herself with other talented artists like herself. I found her Art of Silliness just the right amount of easy for my busy schedule. From her tutorials page, I tested out my skills and was so smitten, that I bought her online class "Blobimals Artist Books" - it was a lot of fun and so freeing. I have to say that I am finding blobs everywhere to draw inspiration from. I think people are wondering why I am taking pictures of sidewalk cracks. As always, links are below and samples of my attempts follow - feedback welcomed. Enjoy and next up - Year of the Fairy Tale - keep you posted. "Mommy? What's for Breakfast?" Mini Me asked. We had Shrimp Scampi last night - so for breakfast I thought let's whipped up a quick pot of grits, saute some onions with cilantro and crisp up some bacon bits (okay we like our bits large) to go with the leftover shrimp. "Delish Mom!" said the little people. Delightful hugs came with this compliment - yay!! I am so lucky! The last 5th Birthday celebration around here was a "Bad Case of Stripes" for my darling daughter - this time my son chose the famous and very yellow "Despicable Me Minions". Funny how it matches his personality -- Muwahhhhaaa! The Birthday Boy and his Minion for the day! The Toy Surprises made it into our palm terrarium. My daughter’s school put together a recipe book to raise funds for PA initiatives. Parents along with their kids from Kindergarten to Grade 4 submitted their favorite Quick and Easy recipes. This was our submission. This is an old breakfast recipe from the Bahamas. It was originally made to cure the morning after hangover but has become a traditional dish served during breakfast often with Johnny Cake, toast or grits. It is also a great chicken soup alternative for the common cold. In a large pot combine cleaned/halved chicken pieces, onions, and juice of 2 lemons, salt and black pepper and let marinate (15 minutes) while preparing potatoes. Add potatoes, allspice, and water to cover chicken. Turn stove on high heat and bring pot to a boil about 25 minutes. Add the juice of one lime and two sour oranges. Continued to boil on medium heat about 35 minutes, add butter (optional), salt, lime and hot pepper to taste (be careful). Boil until potatoes are done, stirring occasionally. Serve immediately or after cooling, let stand in refrigerator overnight. Serve hot with Johnny Cake, buttered toast or grits on the side. Add lemon, lime or pepper if desired. Discard allspice. She is beautiful. A muse of sorts. She loved being on the surface feeling the sun on her face and the wind in her hair. She comes from some where unknown. Beneath the surface. Near Bimini perhaps. Where the road long ago once bustled with fins and perhaps even feet. She surfaces for only one minute. It is forbidden. You have seen her. A glimmer out the corner of your eye. No ones believes she exists. Her father has strict rules about contact. But she yearns to meet the land people. It makes him angry every time. Then winds blow with rage. Ships enveloped by the waves on a sunny day. Lives are lost. All her fault.She is sad. Alone in her beauty and knowledge. She leaves it all behind. Banished by self to solitude. Now the Bimini Road lays untouched. We, the Girls, have been smitten with DIY lately and honestly, YouTube has everything us gals of our "quick craft something in a hurry" is searching for. Yes, if you are wondering, it is very therapeutic. Okay, okay funny but true. We are simply obsessed with Simply Joules. Where on earth does she have the time for all of these tutorials. Ah but who cares, they are fantastic; we love them and yes, have to have 'em! Like-Like-Like! Darn, we can only click the Like button once. My daughter and I spent the afternoon bonding over beads, as there is no room for boredom in my family. For me, it is always a great way to de-stress and relax, as for her, it's fun and in the end she has something pretty to wear. This project seemed easy to make, however, we had everything except the cable ties. Shucks! One hour later, we were in Home Depot and the electric supplies aisle. We looked everywhere, but they only had the large black or white ties available. My hopes were dashed as those boring ties did not come in the size we needed. But we were not to leave empty handed. Our precious daughter who is half my height checked the shelves below one last time and scored big. Who knew? Home Depot not only had the size we needed but they came fantastics bright colors too. We jumped up and down, yelled "Eureka! "and scurried off to the self check out. Life is grand, we made two necklaces, a double strand for her and single for me. Gorgeous darling! Repeat after me - So Easy, So Much Fun and Sooooooo Pretty! Boredom doesn't really run in my family, but sometimes there is a half an hour or so between life for the fun stuff. That is usually when my daughter throws her doe eyes on me for a quick project. I fall for it every time. Not because, she is cute, but because we love quick projects for instant gratification and who needs a reason for making jewelry girl time. Youtube and Kollabora are our main go to sites. In no time we were beading and pinning. I made a blue tribal necklace and Noree went with pretty in pink. It took no time at all, and we got lots of compliments the next day. Yes, I took a class - Surprise Surprise!! 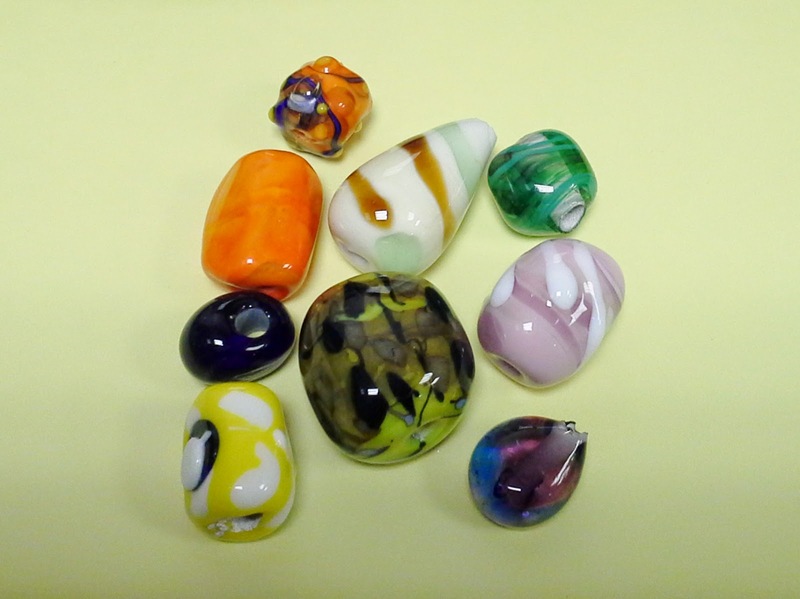 Glass blowing beads this time. I loved it and am still trying to figure out how I can fit a proper workspace and torch in my NYC apartment. Torches... apartment - hmmmm - maybe not. I mean they rent studio space outside for this, but when the creative bug hits you at midnight what do you do? Anyway, I had an awesome teacher, Amy Lemaire and co-teacher, Maria Aroche and it was so unbelievably easy to catch on. But alas, patience or the lack thereof was my enemy. It took at least 30 minutes to make a small bead nice and round, and 45 minutes to make it beautiful. I think I forgot I was a beginner (way to excited) and two of them did not make it. The class was a two-day intensive at Brooklyn's very own Urban Glass and I did not want it to end. I fancied in my day dreams that I was going to be another Stephanie Sersich or Heather Trimlett and even to be as good as Amy, who by the way makes beads look like they created in another dimension; they are just beautiful. These ladies are so talented that I was green with envy. However, I was very lucky to get Amy as my instructor, she is brilliant. We are planning a trip to Upstate NY and to the Corning Museum. They have demonstrations everyday on glass blowing and even quick workshops for kids. Anyone, any age can make something. Very exciting stuff huh? Stay tuned - I will report back when ever we get the chance to go. The Princess on Etiquette and such!! Introducing the new book by Princess Noraline Aubergine of Brooklynshire in the Land of New York. 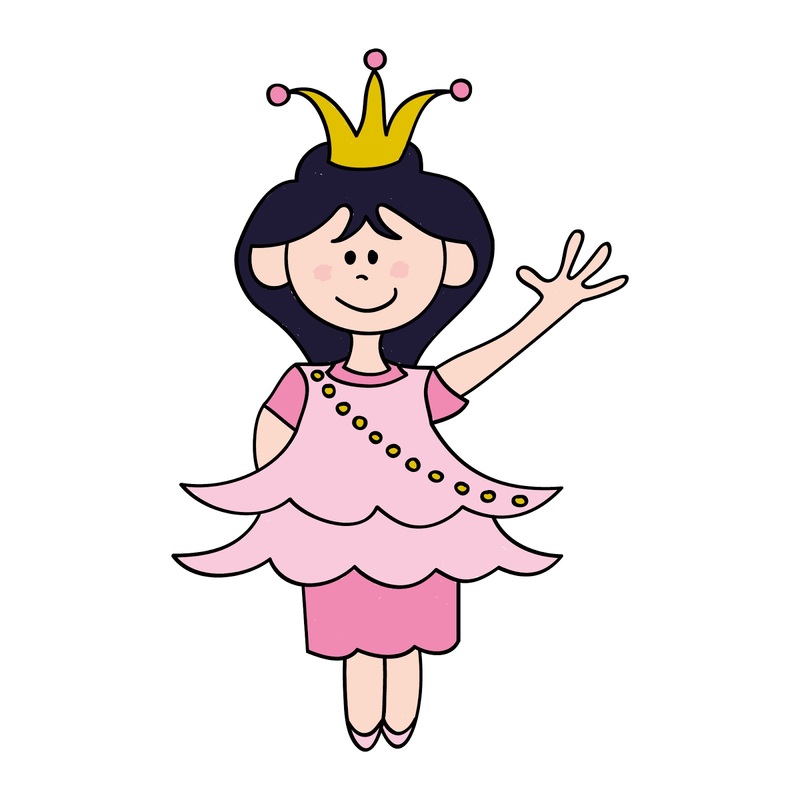 My daughter and I developed this little-big book because she loved being a princess, not just pretending, but being an everyday Princess. I saw it as an opportunity to teach her about etiquette and positive living. 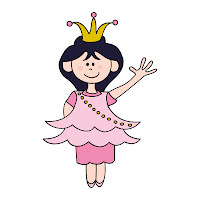 Our hope is for little ladies around the world to use their time as a Princess to make their kingdom a better place. Tiara not included. For little darlings age 4 to 7 - No brothers allowed!! This ebook is available for IPad's IBooks and print of course. Merci, Danke, Gracias, Arigato and Thank you for stopping by. I subscribe to Martha Stewart Living and rest assured her team always comes up with the best ideas to celebrate every holiday you can imagine. The Fourth of July is no different from cupcakes to cool drinks and if it's a creation in red, white and blue with simplistic elegance, then it must be MSL. My daughter, Miss Aubergine wanted to make cupcakes. I wanted a relaxing day off with nothing to do but lay around like the Countess that I am. So when I came across the recipe for Fruit Salad Ice Pops, an efficiency light bulb hit me over the head. "YooHOOOOO Epiphany!!" "Why spend anytime in the kitchen making it hotter than necessary; make cool treats in honor of America's birthday and relax the whole time." - That's one smart lightbulb. Miss Aubergine was playing with them and ahhh no ((shrugged shoulders)) - I guess we must improvise. I am beginning to think this blog is about improvising. Well, we have plastic cups and wooden popsicle sticks, strawberries, blueberries and white grape juice - sounds like we have a plan. As the original recipe stated, I compacted the fruit as much as possible into the cups and poured 100% grape juice in to cover. Into the freezer they went. After an hour and a half, we served them on the stick and in bowls with a dollop of whipped cream. Thanks Martha - the kids were over joyed. Easy tips: wedge sticks in middle of strawberries to ensure there is no movement and do not overfill - remember it expands in the freezer. Celebrating Big and Keeping it Cool - Happy 4th Y'all!! Fancy a cucumber sandwich or crumpet? Oscar, Oscar... are you there, darling? Giada at Home's episode of "Go Fly A Kite", where the family goes out on a picnic was simply divine. The recipes - simple, the flavors a delight. Of the three items she made including strawberry meringue clouds, we had the ingredients to make one of the dishes "as seen on tv". But that did not stop me from making two and making it my way. The original recipe is linked below along with a few items I substituted for my version of "Just Baked". Subbed: Garlic Basil Jack for Gruyere, Ham and Bacon for Pancetta, and Roasted Tomato Italian Bread for Country Style Bread. Brunch was delish - mangiare tutti! !